Tanzania flew into Nigeria Thursday with the target to achieve their first-ever win over the Super Eagles in an AFCON 2017 qualifier on Saturday in Uyo. The delegation of Tanzania’s Taifa Stars to Saturday’s 2017 Africa Cup of Nations qualifying match against the Super Eagles landed in Abuja on Thursday aboard an Ethiopian Airline flight, and immediately flew to Uyo aboard a Dana Air flight same day. NFF’s head of protocol, Tunde Aderibigbe, received the contingent in Abuja and flew together with them to Uyo, while NFF deputy general secretary Emmanuel Ikpeme received the delegation at the airport in Uyo, before the visitors were driven to the Ibom Le Meridien hotel. The Taifa Stars are still searching for their first win over the Super Eagles after five previous clashes. The first encounter between the two teams was at the 2nd All-Africa Games that Nigeria hosted in 1973, with Nigeria edging the tie 2-1. In 1980, at the 12th Africa Cup of Nations finals also hosted by Nigeria, the Green Eagles lashed the Taifa Stars 3-1 in the tournament’s opening match. In the qualifying race for the Spain ’82 FIFA World Cup finals, both teams drew 1-1 at the National Stadium in Lagos, before Nigeria won 2-0 in Dar es Salaam thanks to goals by John Chidozie and Christian Nwokocha. The Eagles walked over the Taifa Stars in a 1986 Africa Cup of Nations qualifying fixture. 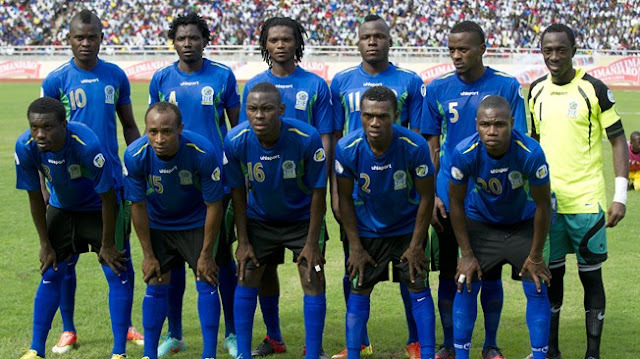 In the first half of this fixture, in Dar es Salaam in September last year, both teams drew 0-0. In the meantime, officials for Saturday’s match also arrived in Nigeria on Thursday. They are Bokinda Inyangi (Democratic Republic of Congo), who is match commissioner, and Algerians Mehdi Abid Charef (referee), Abdelhak Etchiali (first assistant), Ahmed Tamen (second assistant) and Mustapha Ghorbal (reserve referee).